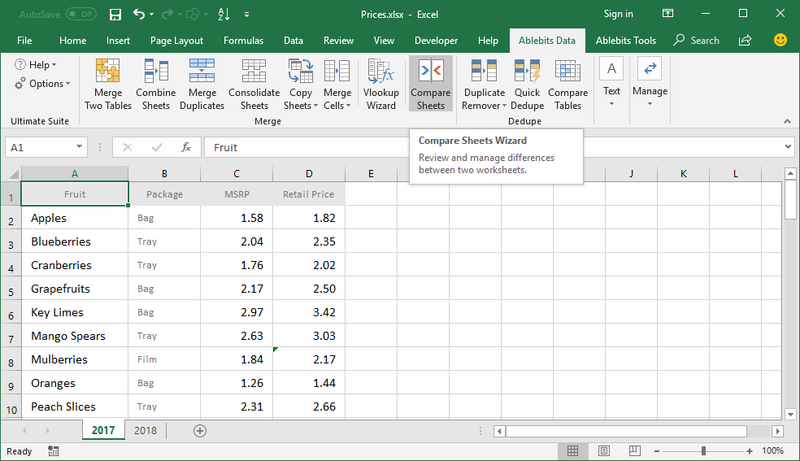 The Compare Sheets tool will help you quickly find and highlight differences between two Excel spreadsheets or lists. The add-in detects differences in values, formulas, formatting and marks unique rows and different cells with fill, font, or border color. Once the differences are found, your worksheets are placed side by side for you to comfortably review and merge the differences. Check sheets for different cells Find all the cells that are different in partially matching rows. Ignore or consider hidden and empty cells It is up to you whether to include empty and hidden columns and rows into the comparison or ignore them. The tool can do both. 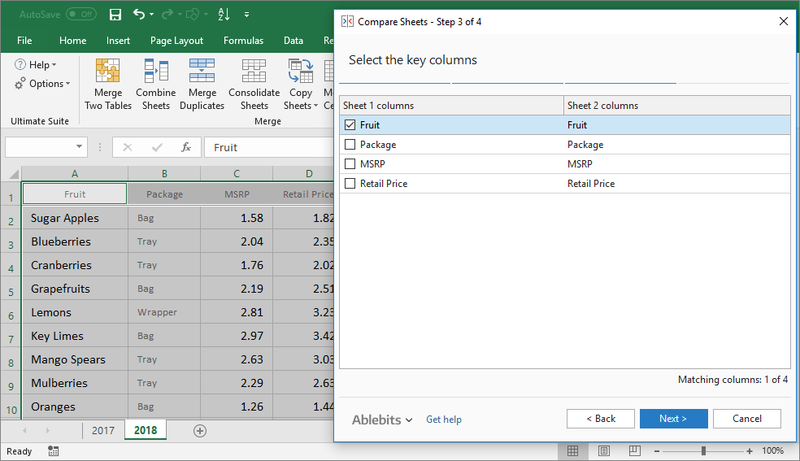 Merge differences with a couple of clicks Open your sheets in a special Excel mode, place them side by side and merge all found differences under full visual control. Copy different cells to the second worksheet Just one click and all the selected cells are automatically copied to another sheet. Compare sheets of different types Compare pricelists, invoices, balance sheets, contracts, or reports. Choose one of the algorithms for processing unstructured sheets, column-organized lists and one-to-one reports. Find unique rows Identify rows that are present in one sheet and absent in another. Find differences in formulas and formatting If differences in formulas or formatting are important for you, check the corresponding options. Choose the way to identify differences By default, we use background color to show differences, but you can also select font color or bottom border. Insert unique rows in the other sheet Using a special button, you can insert the rows that exist only in one sheet in the other sheet. Delete differences in one go Select the cells you want to remove and get rid of them with the help of the delete button. What is Compare Sheets for Excel and what do I need it for? 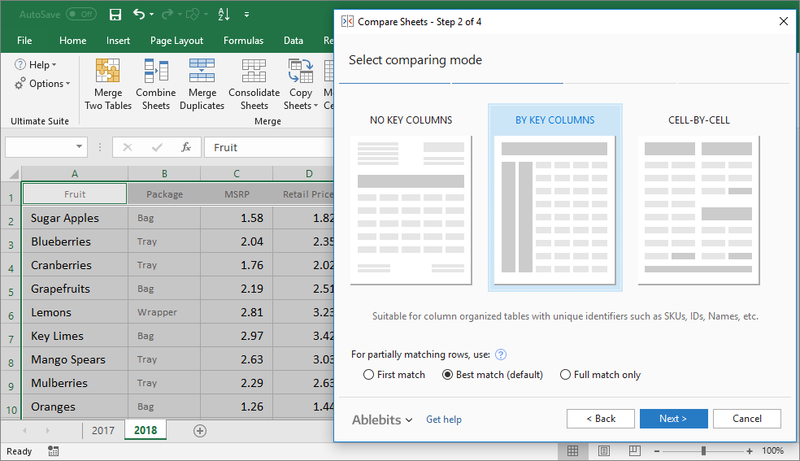 The Compare Sheets tool is part of Ablebits Ultimate Suite for Excel that will help you quickly find and highlight differences between two Excel worksheets and tables. Compare Sheets can check your Excel lists for unique rows and differences in values, formulas, and cells formatting. The tool shows differences with fill, font, or border color. How to compare two Excel spreadsheets? Save changes and close all Excel workbooks except for those that you are going to compare. If your task is to compare sheets from one workbook, leave only this workbook open. Click the Compare Sheets button on the Ablebits Data tab. Select sheets or ranges you need to compare. Click Next. Identify the type of sheets you are working with and choose the comparing mode. If you choose NO KEY COLUMNS or BY KEY COLUMNS, select the matching option. Click Next. If you selected the BY KEY COLUMNS comparing mode, choose the key columns for comparison. If your choice was NO KEY COLUMNS or CELL-BY-CELL, you skip this step and get straight to the next one. Decide, whether you want to show differences in formulas or formatting, and if yes, tick the appropriate checkboxes. Make up your mind about hidden and empty rows, uncheck the corresponding checkboxes if you don't want to ignore them. Choose the way to mark the differences: with background color, bottom border, or font color. If you want to identify the differences in a status column, check the appropriate option. 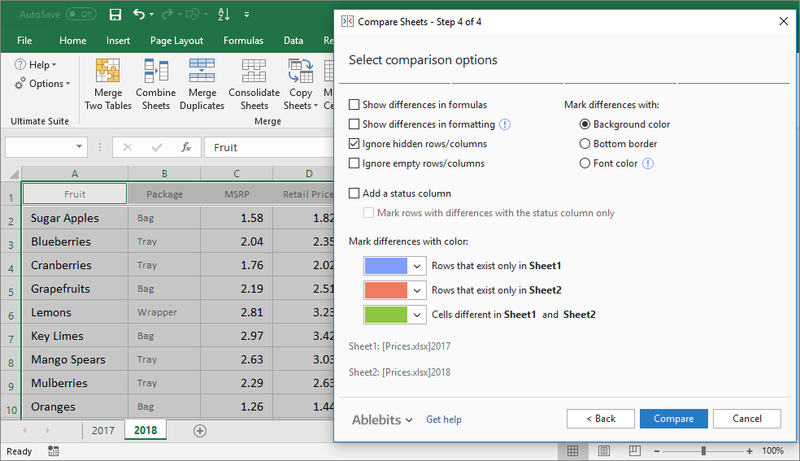 Select the colors that will be used to mark rows that exist only in sheet 1, only in sheet 2, and cells that are different in sheet 1 and sheet 2. Click Compare. Please find a more detailed instruction here. How are the differences between two sheets displayed? After you click Compare on the last step, your files are opened side by side in a special Review Differences mode. The cells are colored the way you've chosen. Each window has a vertical toolbar with several buttons. In the inactive sheet the toolbar is disabled and decolorized to make you more focused on the active worksheet. Now you can review and merge all the found differences with the help of the toolbar. 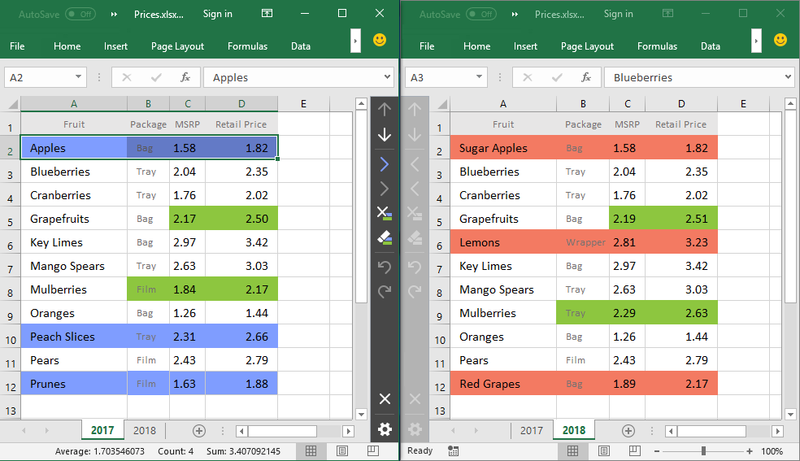 You can navigate between them, select and insert unique rows to the other worksheet, copy the selected different cells to the other worksheet, delete the differences, or remove all the difference marks from the selected cells. Can I compare two sheets from different files? Sure. 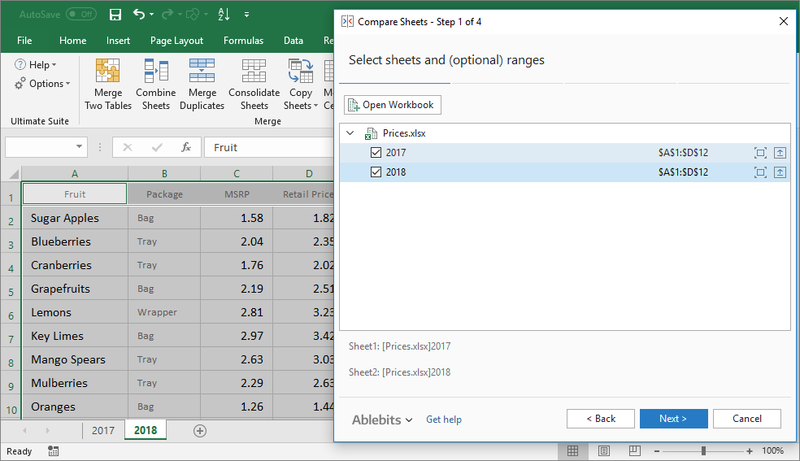 Your sheets can be in the same workbook or in two different Excel files. What if I need to compare two tables in one worksheet? Unfortunately, the Compare Sheets can't compare two tables in the same sheet. In this case, please use another tool included in our Ultimate Suite that can find matches and differences in any two sets of data in Excel, no matter their location. For more information, please see Compare Tables for Excel. Can I compare two invoices? Yes. To find differences between two invoices, choose the NO KEY COLUMNS comparing mode. Bear in mind, that the add-in doesn't work with sheets that contain merged cells, so unmerge them before starting the comparison. What if I need to compare two price lists and see if the prices have changed or new products appeared? If you compare two price lists, choose the BY KEY COLUMNS comparing mode. What if the sheets that I compare contain merged cells? The add-in doesn't process sheets that contain merged cells, so please unmerge them before running the tool. Can I find differences in formulas? Yes, you can include formulas in comparison by ticking the Show difference in formulas checkbox on step 4. But please do not try to compare sheets that contain volatile functions, because every time Excel opens or recalculates the workbook, these functions return different values. The volatile functions are: NOW, TODAY, RAND, RANDBETWEEN, OFFSET, INDIRECT. Also, INFO and CELL can be volatile, but it depends on their arguments. Can I ignore empty rows? Yes, empty rows and columns are ignored by default. If they are an important part of your dataset, just uncheck the corresponding checkbox. How can I mark the found differences? Besides, you can add a status column to identify the differences between your sheets. Why do I have to select three different colors to highlight differences? Can I identify the found differences in a special column? Yes, just tick the Add a status column checkbox on step 3. How will I see the differences and matches? It depends on the marking option you selected. The differences can be marked either by background color, bottom border, or font color. If there are no differences, the rows and cells won’t be colored anyhow. What is the Review Differences mode? Colored in blue are rows that are unique in Sheet 1 (on the left side). Colored in red are rows that are unique in sheet 2 (on the right side). Colored in green are cells that differ in partially matching rows. Each sheet has a vertical toolbar with several buttons. In the inactive window, the toolbar is disabled and faded out so you get focused on the active worksheet. What can I do with the found differences? Navigate between the found differences. 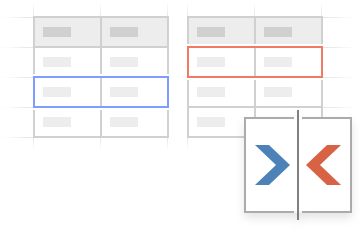 When you go to the next or to the previous difference, the button selects whole rows that are unique in each sheet as well as cells that differ in partially matching rows. Insert the selected unique rows in the other worksheet. Copy the selected cells marked as different to the other worksheet. Remove the difference marks from the selected cells. How to exit the Review Differences mode? When you have reviewed all the differences, the tool will ask if you want to get back to the normal Excel view. If you have made all the needed changes, click OK. If you want to exit the Review Differences mode before while some differences are still unprocessed, click the Exit Review Differences mode button at the bottom of the toolbar. Why does Compare Sheets create backup copies of my files? Compare Sheets creates backup copies of the Excel documents you are comparing because we care about the safety of your files. In case you made incorrect changes or removed important data, you can always find the copies of your original files in the folder you specified in the add-in's settings. By default, the backups are stored for 14 days.